Which company will step up and earn the wfa fall title? On Sunday, November 19, WFA will descend upon Walnut Creek’s Ultimate Fieldhouse for the Fall 2017 Playoffs. After a season filled with upsets and blowouts, overtime thrillers and last second shootouts, any team could win the title. In each division there are certainly favorites, but that only means the underdogs are hungry for upsets. Oath is the favorite to win Division 1 on paper. They’re the defending champion from last season and the top seed. On the other hand, Google has shown flashes of brilliance and have a mercurial roster full of players that can get hot in a hurry. There is no love lost between these teams, and their games have been known to get chippy. Though the outcome of this game is anyone’s guess, one thing is certain: emotions will be running high. Oath’s Allen Reitter has developed a reputation for trash talk throughout this season and really comes alive when he’s jawing with someone on the opposing team. Look for him to make a splash with his play and his talk on Sunday. Outside of Reitter, Oath is mostly the same team as they were last year. They have a well balanced inside-out attack based around big men Greg Palmer and Marcus Taylor, and guards Andrew Moeller and Adonis Allen. Moeller is the floor general, dictating the tempo and spreading the offensive wealth. Palmer and Taylor are frequently the beneficiaries of his generosity with their size and ability to play in the post or on the perimeter making them dynamic weapons. Allen is known for his intensity and knockdown three point shot, making defenses pay for even a split second lapse in attention. They’ve had an up and down season, and hope to catch fire and stay hot on Sunday. Google’s season has been one of mostly unrealized potential. At times they’ve struggled with hectic work schedules, leading to spotty attendance and undeveloped chemistry. However, when they have their full squad they are a force to be reckoned with, and you have to believe they’ll show up with a full roster for the playoffs. Their nucleus is their front court of Brian Williamson and Jamie Smith. Williamson is the tallest player in the league at 6’9”, and he knows how to use every inch of his frame. Though Smith is five inches shorter he makes up for his deficit in stature with pure physicality. These two will present serious matchup difficulties for Oath’s Palmer and Taylor and should be very fun to watch. With both teams atop the Division 1 rankings at one point or another throughout the season, these two teams have shown that they know how to win. Unfortunately they both had some hard luck down the stretch in the regular season, but that’s only made them hungrier for a championship, eager to prove their early season success was not a fluke. They only met once in the regular season and Salesforce won handily, so they’ll attempt to replicate that performance. Logitech, however, will attempt to flip the script and leave Salesforce in the dust. Logitech is a seriously deep team, with a roster loaded with tough, smart players (including CEO Bracken Darrell). They are at their best when out-working the other team and willing their way to victory. It’s typically John Wie and Peter Spadalik who lead them in these efforts. Wie is one of many well rounded big men in WFA. At 6’4” he can throw his weight around down low and scrap out tough baskets among other bigs, but where he sets himself apart is from long distance. He makes his presence felt from beyond the arc every single week, so Salesforce will likely key in on him on defense. Spadalik has had a rollercoaster of a season, but he’s tough to stop when he’s at his best. As long as he stays aggressive he’ll be a key player in this game and Logitech will be better off for it. Salesforce has just as deep of a roster as Logitech and they love to spread the ball around. Tough lefty duo Stephen Tee and Hudson Blake strike fear in the hearts of even the strongest opposing defenses. Tee controls the ball most of the time on offense and facilitates before he gets his own buckets, but time and again he’s shown that he can really fill it up when he needs to. Hudson Blake has been one of the best scorers in the league this season as a crafty lefty who can get to the rim at will and finish with either hand. He also has no problem stepping back and shooting the three, making him tough to predict and even tougher to guard. Complementing the two lefties is a well rounded roster of hard-working players who love to compete. When they’re firing on all cylinders, they’re tough to stop. In their two regular season matchups, each team won on game and the games were decided by a total of four points. You could say these teams are evenly matched. This game will be doubly intense given that it is both a tiebreaking grudge match and a playoff game. While MLB attacks with a frantic pace and relies heavily on their dynamic duo of Jeff Paulo and Stephen Mueller, Sojern brings a slightly more balanced attack and works through their offense methodically. The contrast in styles should make for a great matchup. MLB’s teamwork is nearly unparalleled in this league. Their camaraderie is apparent both in their demeanor and in the results of their games. They trust each other and play together as one, which is essential when things get tough in playoff games. Stephen Mueller has led their offensive attack all season with his relentless slashing and soft touch. Though Jeff Paulo has struggled a bit compared to last season, he’s still one of the deadliest shooters in WFA and needs to be treated with extreme caution by any and all defenses. Big man Andrew Spock has given their offense some balance and serves as their anchor in the paint. He’s a great athlete who has given opponents fits down low all season and who Sojern will have to stop if they want to win this game. This season has been a journey for Sojern. They came in as an unpolished group and struggled initially, but they’ve found their stride and their winning formula throughout the season and they hope to carry some momentum into the playoffs. Sojern relies on Nicki Nardella, Alex Rodriguez, and Alex Mortensen to set the tone and provide much of the offense for their team. Nardella is a baller who slashes to the rack with reckless abandon, but don’t leave her open from long range either because she’s a knockdown shooter. Rodriguez plays with a massive chip on her shoulder and has fun doing it. She throws herself all over the court and is the source of Sojern’s emotional fuel every game. They’ll need her passion and intensity to make a playoff run. Finally, Mortensen is a do-it-all scorer who, much like Nardella, can hurt defenses from deep and by driving in the lane. These three will need big games to upset the top seed on Sunday. These teams have both shown flashes of excellence throughout the season, but really struggled to string more than one or two consecutive games of strong performance together. 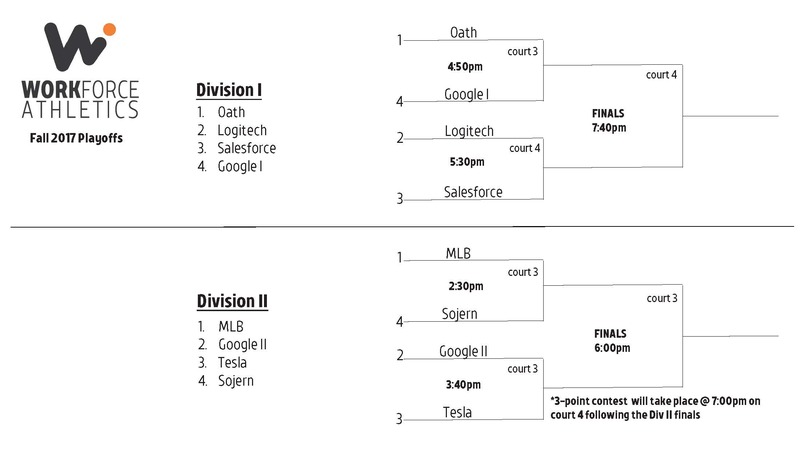 In their lone regular season matchup, Google emerged victorious, but only by six points. Google has a roster full of hard working coachable players. They can be extremely tough to beat if they get hot. Tesla has improved nearly every week this season and will need their WFA vets to step up and lead the way into the playoffs. Google is an even-keeled team with a hunger to learn and improve, and they’ve done exactly that this season.They’ve beaten the teams they were supposed to beat, and played favored teams closely but never emerged victorious this season. Stretch forward Aaron Madfes is their jack of all trades, serving as the team’s post presence, defensive leader, and often offensive facilitator. He really can do it all, and he’ll have to for Google to win. Guard Carl Reyes is a nifty scorer as a lefty who thrives in the midrange game. He’s got an excellent midrange jumper and a soft baby hook that’s nearly impossible to defend. The X-factor for this Google squad, though, is Tom “The Worm” Davich. As though his pink hair weren’t enough to set him apart on the floor, his grit and heart really get his team going and takes Google’s game to another level. He very well could be the spark to ignite their championship run. After a massive roster overhaul from last season, Tesla has had to really dig deep to win this season. They’ve taken full advantage of WFA’s weekly clinics, and their hard work has paid dividends on the court. To win in these playoffs, they’ll need to pull out every trick in their bag, starting with WFA veterans Brian Billeci and Caleb Russom. Billeci has one speed: full throttle. When he puts his head down and goes to the basket, there isn’t much that can stop him, and he loves to get out in the open floor and run. Russom has really come into his own this season and has emerged as a real leader. He’s a textbook two-way player who will guard the opponent’s best player and still find a way to get his on offense. Ariel Shemtov and Athansios Gerostopoulos provide an extra offensive burst that, along with the rest of this Tesla roster, will be rearing to go on Sunday. ©2019 Workforce Athletics / SportsEngine. All Rights Reserved.